I’m so excited to share our Shopkins Party with you! 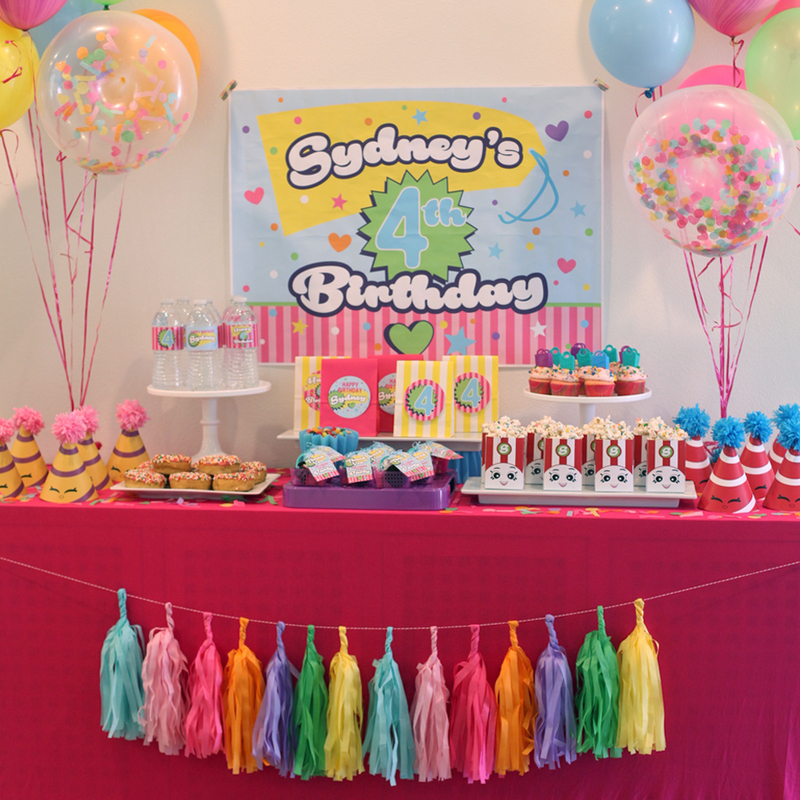 I designed these Shopkins printables collection for my niece Sydney…. she has LOVED Shopkins from the very beginning. I was flying into town the day before we were having the party so I knew I wanted to keep this party simple and do able with the timing I had. I knew I wanted to create a large poster for the backdrop and some fun balloons! I created Donut Sprinkle Balloons for our Shopkin party. Everyone loved these. We created a party hat for every guest. Yellow/ Pink for the girls and the red/ blue for the boys. Our Shopkin party hats were easy to make and I was able to make them ahead of time! For the treats we made pink cupcakes topped with Candyfetti sprinkles and Shopkin baskets. For our favors we had small bags filled with some goodies and toys. They were just partially filled as we had a piñata and wanted each kid to have their own bag to fill with the goodies from that as well. Our 3.5″ circle favor toppers can also be placed onto of a bag for a traditional favor topper. Everyones favorite treat was our white chocolate covered popcorn. It’s easy to make and tastes fantastic! The Shopkins popcorn box is included in our Shopkins printable set. We created this custom tissue garland. Over 80 colors to select from in our shop! OMG i love all this decoration. My daughter wants a Shopkins party. How can i go about to do something simaler to this. Where do you find the donut shaped balloons?! Sorry I just saw this. If you are still needing the donut shapped balloons I can help you with that. They are $1.50 each. Let me know how many you are needing? I have a Question so how do I go about printing out the poster? And labels period would I have to go to staples? You can print all the items at home, except for the large poster if you want it the size it is in the photos.